Raspberry & Brie on the left. Goat cheese, caramelized onions, and thyme on right. OMG yes more please. We recently celebrated the husband’s birthday with an amazing potluck dinner. I was in charge of bringing an app and dessert. I’m a huge fan of those small fillo cups you find in the freezer. They’re about $2 for 15. I keep two boxes in my freezer at all times in case of unexpected guests. Fill the cups, bake them, done and delicious. 1) Raspberry & Brie: Fill the bottom of the cups with brie (about 1 tbsp) and top off with equal parts raspberry jam. Bake for 10 minutes at 350 degrees F and done. 2) Goat Cheese, Caramelized Onions & Thyme: Fill the bottom of the cups with a small spoonful of goat cheese (I found honey gouda goat cheese at Trader Joe’s – OMG heavenly). Sprinkle with a dash of dried thyme. Add a topping of caramelized onions. Bake for 10 minutes at 350 degrees F and done. Honestly, the caramelized onions take the longest in all this – about a half hour to cook. I used 3/4 of an onion for 30 cups. 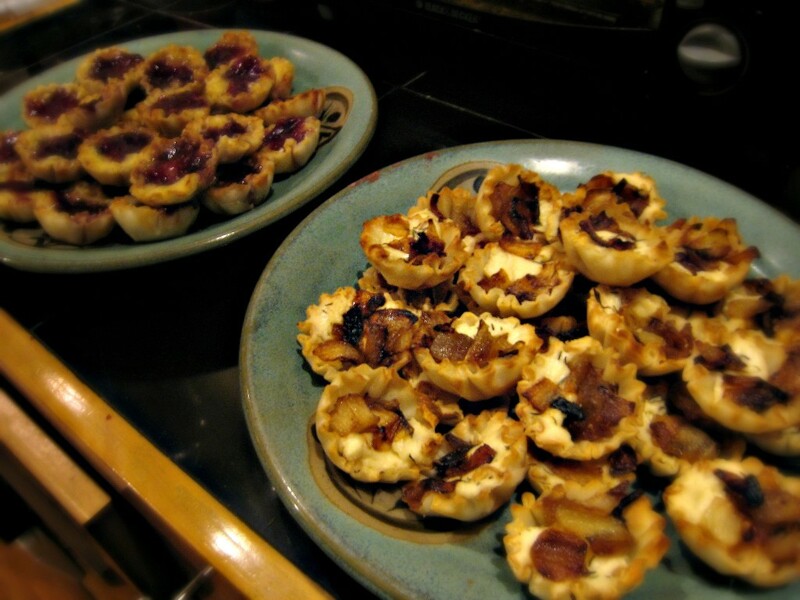 While the onions are caramelizing you can prepare the raspberry & brie cups. Bake all the cups at the same time. Don’t know how to caramelize onions? It basically requires onions and a lot of butter. Here’s an easy recipe. 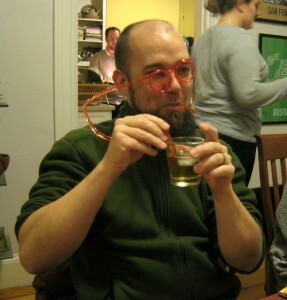 The husband Case enjoying whiskey through a crazy eyeglass straw. Both were awesome gifts. Do you need a quick dessert? Fill fillo cups with Nutella. I usually add mixed berries (fresh or frozen) to one half of the tray and peanut butter + a slice of banana on the other half. Bake for 10 minutes at 350 degrees F and done. These recipes are a HUGE hit – they’re super tasty and easy to eat. There’s zillion more recipes for fillo cups, but I’m all about the easy ones that give me leftover cheese to eat. This entry was posted in Random. Bookmark the permalink. Follow any comments here with the RSS feed for this post.